After Angela Agganis, a former employee at T-Mobile's call center in Maine, reported unwanted and inappropriate sexual advances from her supervisor, T-Mobile threatened to fire her if she discussed the situation with her coworkers and tried to pressure Angela into signing a nondisclosure agreement. Refusing to be silenced, she resigned and contacted her union, TU. Together they went to the National Labor Relations Board, and T-Mobile was found guilty of violating her rights. 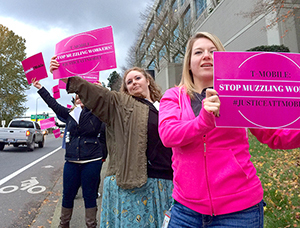 Activists deliver petition signatures to T-Mobile's corporate headquarters in Bellevue, Wash.
T-Mobile only had to withdraw that illegal policy at Angela's call center. The rest of T-Mobile's 46,000 employees still don't know they have the right to speak to each other and seek assistance from others about workplace issues like sexual harassment. "These gag order policies put workers at risk every day. And we know of many other workers who have been through the same ordeal and are too scared to speak out. This needs to stop!" said Jeanne Stewart, president of CWA Local 7803, delivering the petitions to T-Mobile offices in Bellevue, Wash. "Fifteen thousand petition signers agree with us: T-Mobile should do the right thing and let workers know in all its locations across the country that this policy is unlawful. The company needs to let all employees know they have the freedom to speak out, so that sexual harassment, discrimination and other kinds of harassment cannot be swept under the rug anymore." Kimberly Anderson, an AT&T Mobility worker, also joined the delivery to show T-Mobile employees that even the competition has their back. "We wireless workers have to stick together and fight back attempts to pit us against each other in a race to the bottom," she said. "Whatever happens at T-Mobile concerns everyone working in wireless. That's why I'm here today. I want T-Mobile and especially T-Mobile workers to know that we AT&T Mobility workers support our brothers and sisters at T-Mobile and together we're building a movement of wireless workers to lift up standards for everyone." The company's failure to act has serious consequences, noted Becky Smith, deputy director of the National Employment Law Project. "Sexual harassment is a pernicious, endemic problem among low-wage women workers, and women come forward when they have support from co-workers who may be victims themselves. Gag orders like that at T-Mobile ensure that harassment and discrimination continue," Smith said. The German Embassy also got an earful this week. At this week's Coalition of Labor Union Women's 18th Biennial Convention in Sacramento, CA, AFL-CIO Secretary-Treasurer Liz Shuler asked attendees to call the German government, which owns a stake in T-Mobile's parent company Deutsche Telekom, and demand that the company stop maintaining unlawful policies that silence people on the job.